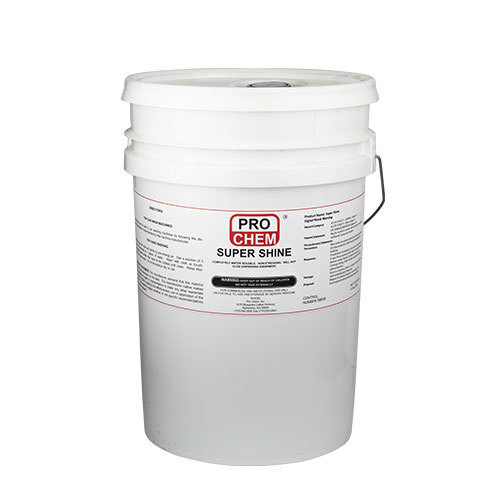 Super Shine | Pro Chem, Inc.
SUPER SHINE is manufactured from special synthetic detergents and wetting agents to remove dirt, dust, grime and road film from automotive finishes quickly and economically, leaving a super shine. It contains no film forming soaps. It will not dull or water spot, even on chrome surfaces. It is so concentrated that as little as three ounces per gallon of water gives gobs of active suds that clean thoroughly and rinses freely. For Car Wash Machines: Concentrate can be used in car washing machines by following the dispensing instructions recommended by the machine manufacturer. For Hand Washing: Remove loose dirt, dust and grime by prerinsing car. Use a solution of 3 ounces concentrate to 1 gallon of water. Wash with cloth or brush. Excessively soiled areas may have to be rubbed until clean. Rinse thoroughly with clean water. Do not let solution dry on car.